Metallics can be daring and now the fashion news is that next season is going to be all about shine, sparkle and shimmer with hints of silver and flashes of gold. Metallic jeans - nicknamed ‘bling jeans’ and are selling fast in Topshop and Zara. Remember that metallic jeans are best for pulling off this trend, because you can tone down the rest of your outfit and keep it neutral and simplistic. - For day-wear, team metallic jeans or skirts with an understated jumper or jersey top. 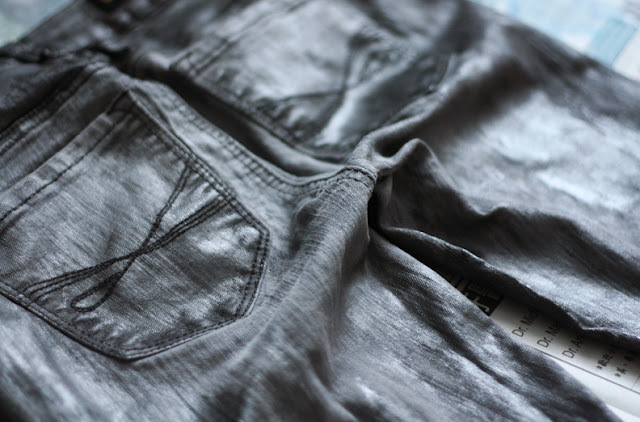 A metallic T-shirt adds a bit of rock and roll bling to plain jeans. - Do not team metallic trousers and top. Ever. - If you don’t want to go all out, try adding metallic shoes, bags or nail varnish to liven up a simple outfit. So keep a look out for these jeans!! If you don't want to buy, get creative and create your own in the comfort of your own home, its quick, easy and you'll have a fab pair of new jeans. 1. You would need an old pair of grey or black jeans, silver/gold, white and black metallic fabric paint, clear varnish, and a sponge brush. 2. Start painting with the silver paint. The paint does not need to be evenly distributed and cover all of the surface area as uneven blotches is part of the charm. 3. 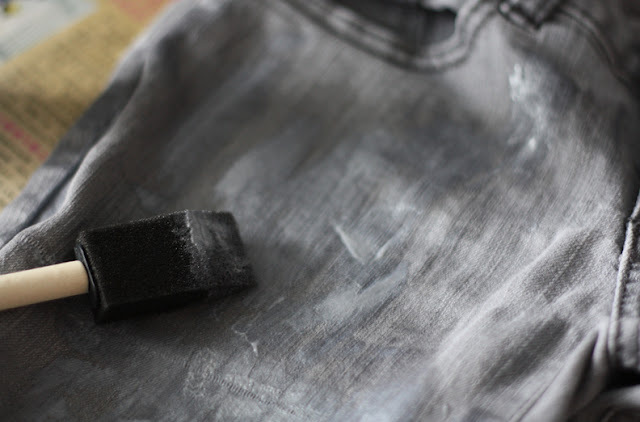 Blend the silver with black and white paint. Paint on top of the first silver coat. Use vertical strokes and try to blend the colours together.